Just as not all healthcare professionals provide the same level of care, not all health websites are equally trustworthy. Most people know by now not to believe everything published on the Internet. However, it can be difficult at times to determine whether or not a health website is giving out accurate and credible information. 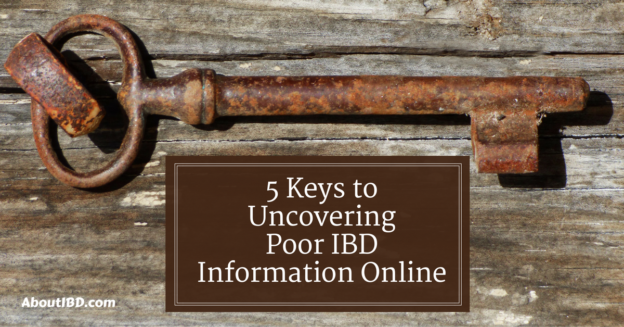 In the journey to learn more about inflammatory bowel disease (IBD), it is vital to use critical thinking and become a savvy information consumer, as these skills will help in sifting through websites to find the ones that can be trusted. How can anyone tell the difference between an IBD website that is worth coming back to and one that should be passed over? There are several different clues that help in understanding if the author of a website or an article is providing quality information that is useful in understanding IBD and in coping with the challenges of Crohn’s disease, ulcerative colitis, or indeterminate colitis. The Internet is a great place to buy stuff. Where this is useful is in reading reviews of items, finding good sales, and getting free shipping. However, when searching for health information, most people aren’t usually shopping for products at the same time. In some cases, the product placement is fairly blatant — under the guise of providing health content, an author or blogger will suggest the purchase of a particular product or item to help with the signs and symptoms of IBD. This is not the same as advertising, as most websites use advertising as a source of revenue to keep the site up and running. Ads will, ideally, not be integrated into the actual content of the site. In other words, ads will be to the side, or at the top or bottom of an article, but ad copy will not be actually within the article itself. However, when the crux of an article or blog post turns into “buy this to feel better!” the content is immediately questionable. That doesn’t mean the information is always bad but some web sites will encourage the reader to believe they have a problem in order to sell the solution. Truly factual web sites providing quality information will not encourage the purchase of a particular drug, supplement, or device from them. Key #2: Who’s Writing This Stuff? Some mainstream medical websites do not provide one very simple piece of information: a byline. A byline is the name of the person that wrote the piece of content you are reading. In order to be considered truly credible, the byline should be visible with a way to find out more about that person. Ideally, there will be more than just a name and clicking on a byline or a picture should take you to more information, such as their qualifications. In many cases, big name health websites will have their articles written by staff writers, often without a byline. These could be employees of the site or they could be freelancers. They may or may not be specialists in gastrointestinal disease or IBD, but there’s no way of knowing unless there is a byline attached to the article. If there’s a question or correction needed, there should be a way to get in contact with that person. Also, the byline should be a real person, who, if they’re a content creator, will also usually have a Twitter, Facebook, LinkedIn, or other social media account. In some cases, the made-up byline leads nowhere because there’s not an actual person behind it, and that information is therefore immediately questionable. Key #3: Who Reviews the Content? Ideally, any website that is providing health information will have a qualified group of health professionals who review the content and ensure its accuracy. In the case of information about digestive disease, the reviewer should have a background in gastroenterology. 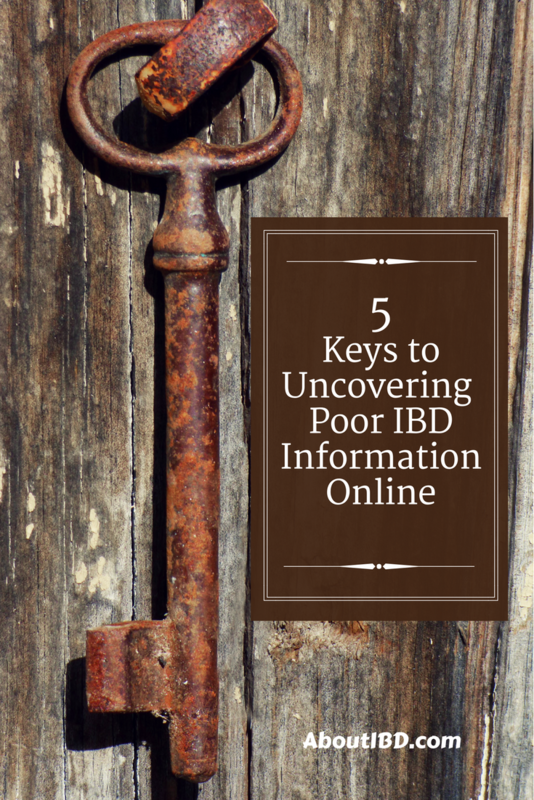 For IBD, this person should also be up-to-date on current treatment methods for IBD. The name and qualifications of the reviewers or the review board should be accessible and readers should be satisfied by their qualifications. If it’s not possible to dig into the background of reviewers, or any information looks suspect, that’s a good reason to question the validity of the website. Key #4: Who Owns The Site? At the bottom of any legitimate website will be certain information about the publisher. The name of the entity or individual who is behind the site, as well as some basic links on how to contact them. In some cases there may also be a dateline, an address, or even a phone number. If this information is missing, and it’s not clear how to contact the persons responsible for the site, be wary. Sites that are only looking for your eyeballs on their advertising or your money through purchases aren’t going to provide their users with legitimate contact information. Key #5: Are There Unverifiable Claims? Another way to determine if a website is credible is to look for the source material behind any facts that are given or claims that are made. If there are no sources given for a piece of information, especially when it’s presented as a fact or a figure, it should be suspect. In addition, sources themselves should be credible, and have all the markings of a legitimate healthcare website. Sources should also be current (within the last 5 years or so), because searching far back enough, you will find many scientific papers and theories about IBD that have been discarded in the modern age. I’m not saying be suspicious of everything you read on the Internet…OK, I actually am saying that. Remember to have that kernel of skepticism about everything until it can be checked and verified. I don’t rely on one review before I buy a pair of shoes, so certainly I’m going to get medical information from a variety of reputable sources in my decision-making process. Taking a step back and critically evaluating a source is the best way to avoid getting bad information that can wind up being problematic and confusing. Oh yeah — also avoid any site that uses the terms “irritated bowel disease” or “irritable bowel disease.” It’s easy to make those typos, and I’m certainly not immune, but anyone who can’t get the name of the disease correct in the first place might not be the best person to offer advice. This entry was posted in Amber Says and tagged awareness, critical thinking, information, writing on March 26, 2018 by Amber.